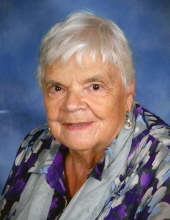 Sharon L. Seeger, age 79, of Boyceville, WI died Wednesday December 5, 2018 at the Mayo Clinic Health Systems in Eau Claire, WI. Sharon was born September 8, 1939 in Menomonie, WI to Julius and Leona (Wagner) Jacobs. She married Fredrick Seeger June 27, 1958 at Peace Lutheran Church in Menomonie, WI. They farmed on Fred's family farm for many years. She also operated store for many years and sold Avon for 35 years. Sharon enjoyed quilting, her bible study meetings, being part of the homemakers, playing bingo and cards while she visited with friends and family. Sharon is preceded in death by her parents, husband Fred in 2017, son Jeffrey, granddaughter Tracy Christopherson, sisters and brother Mildred Siler, Julie Siler and Bud Jacobs. Funeral services will be held 11:00 a.m. Monday December 10, 2018 at Trinity Lutheran Church in Boyceville, Wi with Reverend Bradley Peterson officiating. Interment of cremains will be at a later date at Tiffany Cemetery Boyceville, WI. Friends may call at the church on Monday one hour prior to services. Local arrangements by the Anderson Funeral Home in Glenwood City, WI. To send flowers or a remembrance gift to the family of Sharon Lee Seeger, please visit our Tribute Store. "Email Address" would like to share the life celebration of Sharon Lee Seeger. Click on the "link" to go to share a favorite memory or leave a condolence message for the family.